The study of law was a cornerstone of early anthropological and sociological discussions. Precisely because social scientists like Weber and Durkheim were preoccupied with understanding the processes of social evolution and the form of the state, comparisons between law in European and non–European contexts became a central focus. Today the study of law is a focus of new interest in the social sciences. How is the place of law to be understood? Where does it fit in the totality of social life? It is well known that law is often circumvented, whether in the financial world, in the drug business, in international affairs, or in matters touching on human rights. How much does the law determine what happens in a society? Contemporary social scientists looking at law are now preoccupied with this question as they inspect such topics as international transactions, illegal migration, gender discrimination, political corruption, distributions of property, and reparations by new governments for injustices committed by previous regimes. In Law and Anthropology: A Reader, Sally Falk Moore has created a collection that breaks down disciplinary fences. The Reader brings together historical classics of political thought and examples of contemporary work from social scientists and lawyers. 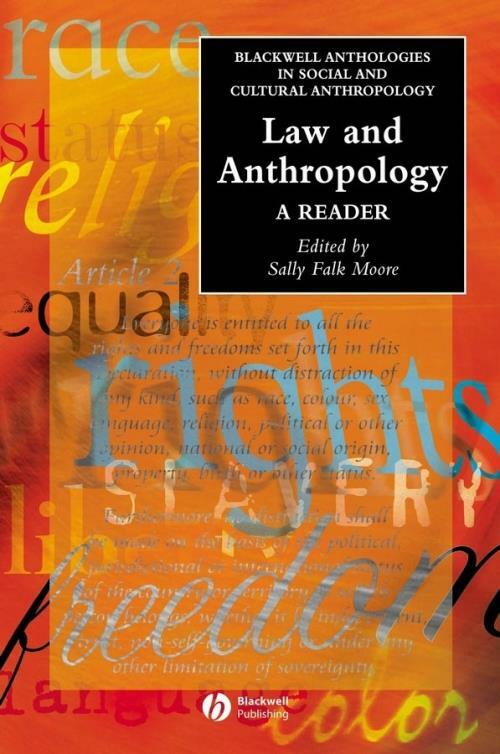 In presenting this varied range of material, Moore offers a remarkable overview of the field of law and anthropology: its development, its present, and potential future courses. Part I: Early Themes That Reappear in New Forms. 1 Plato, Augustine, Aquinas, and Others Asking What is Morally Right: Essays on Natural Law, Ideal Law, and Human Law. The International Bill of Rights, Louis Henkin. Culture and Rights, Jane K. Cowan, Marie Benedicte Dembour, and Richard Wilson. 2 Charles–Louis Montesquieu: Law as an Expression of a Particular Cultural Complex. The Spirit of the Law, Charles–Louis Montesquieu. 3 Henry Maine: The Contrast between Archaic Law and Modern Law. Criticism of Maine s Theory, Norbert Rouland. 4 Lewis Henry Morgan: Evolutionist, Ethnographer, Lawyer. The Historical Place of Property, Lewis Henry Morgan. 5 Karl Marx: The Mode of Production at the Base Law as Part of the Superstructure. Law and Economic Organization, Katherine Newman. 6 Emile Durkheim: Collective Consciousnesses and Law. Disciplinary Power and Subjection, Michael Foucault. Law and Society in Modern India, Marc Galanter. Modernity and Self Identity, Anthony Giddens. 7 Max Weber: The Evolution from Irrationality to Rationality in Law. The Economy and Social Norms, Max Weber. The Theory of Communicative Action, Jürgen Habermas. Law and Social Science, Richard Lempert and Joseph Sanders. Equity and Discretion in a Modern Islamic Legal System, Lawrence Rosen. Part II: The Early Classics of Legal Ethnography: the Real Thing Field work on Law, Rules, Cases, and Disputes. Introduction to the Early Classics of legal Ethnology. 8 Crime and Custom in Savage Society. 9 A Handbook of Tswana Law and Custom. The Judicial Process Among the Barotse of Northern Rhodesia. Justice and Judgement Among the Tiv. Kapaupu Papuans and Their Law. Part III Present Thematic Approaches. 13 Objects of Property and Subjects of Politics. 14 Where it Hurts:Indian Material for an Ethics of Organ Transplantation. 15 Disputing over Livestock in Sardinia. 16 Consensus and Suspicion: Judicial Reasoning and Social Change in an Indonesian Society 1960 1994. B. Identity and its Legal Significance. 18 Locating a Reinvigorated Kentish Identity. 19 Academic Narratives: Models and Methods in the Search for Meanings. 20 Human rights and Nation Building. C. Creating Enforceable Rules, Inside and Outside the Formal Law. 21 Rights, Religion and Community: Approaches to Violence Aginst Women in the Context of Globalization. 22 Regional Practices and the Marginalization of Law: Informal Financial Practices of Small Businesses in Taiwan" Jane Kaufman Winn. 23 Enacting Law through Social Practice: Sanctuary as a Form of Resistance. 24 Deciding Who Gets In: Decision–Making by Immigration Inspectors. D. The Large Scale: Pluralism, Globalism and the Negotiation of International Disputes. 25 Multiculturalism, Individualism and Human Rights: Romanticism, The Enlightenment and Lessons from Mauritius. 26 Governing Economic Globalization: Global Legal Pluralism and European Union Law. 27 Civilization and its Negotiations. E. Law and the Future. 28 Certainties Undone: Fifty Turbulent Years of Legal Anthropology, 1949 1999.